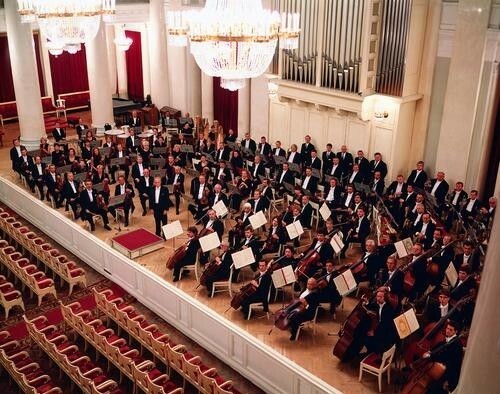 The Sankt Petersburg Symphony Orchestra traces its history back to 1931. For more than two decades, the orchestra’s activity was linked with the Leningrad Radio – at first a concert orchestra, and soon as a large Symphony Orchestra. Working in live broadcast, the musicians mastered a diverse repertoire. Mobility team, which was led by H. Unger, then I. Alterman, facilitated by the cooperation with many conductors: O.Fried, F.Stiedry, A.Gauk, V.Dranishnikov, N.Golovanov, E.Mravinsky, I.Musin, B.Khaikin, E.Grikurov, K.Eliasberg, N.Rabinovich, K.Kondrashin. During the war, the Leningrad Radio Symphony was the only orchestra that remained in the besieged city. Despite the fact that in the first winter of the war the orchestra actually ceased to exist, nonetheless, after heroic efforts, in August 1942, headed by K.Eliasberg it performed the Leningrad premiere of Shostakovich’s Seventh Symphony. Currently, critics argue that “the performance by the St Petersburg Symphony Orchestra can be called highly authentic: there is a feeling that the musicians have inherited from the older generation the tradition of orchestral performance of the ‘Leningrad’ Symphony”. (Tianjin Daily, 2015). Altogether, the orchestra performed more than 300 times during the blockade, and some concerts – including the premiere of the “Leningrad” symphony – were held in the Grand Philharmonic Hall. Since 1977, Alexander Dmitriev has led the orchestra. “The orchestra was really strong. During the performance the audience showed the highest restraint: they made no sound, but after the finale they erupted with enthusiasm – again and again paying homage to the artists. The hall welcomed the orchestra with standing ovations!” (Changjiang Daily, 2015). These words once again prove the fruitfulness of the long-term alliance between the conductor and his orchestra. During this phase of the orchestra’s history, it was awarded the title “Academic”, gave premiere performances in our city of works by Handel, Mahler, Richard Strauss, Debussy, Ravel, Scriabin, Schreker, Honegger, Tippett, Orff, Dutilleux, Arvo Pärt, Schnittke, Nono, Ligeti, Adams, Crumb, Piazzolla as well as Leningrad – St Petersburg composers, and recorded all the symphonies of Beethoven and Schubert, works by Tchaikovsky and Rachmaninov, Ravel and Britten.